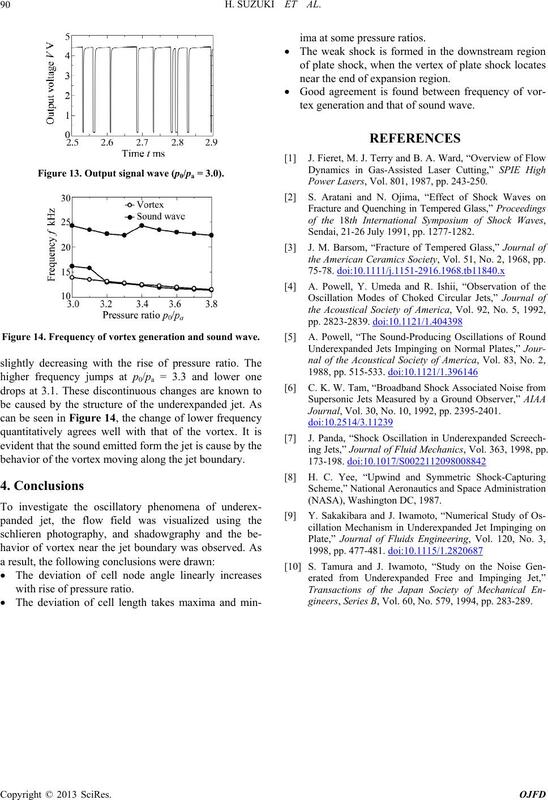 dimensional oscillation of jet and b ehavior of vortices are discussed. 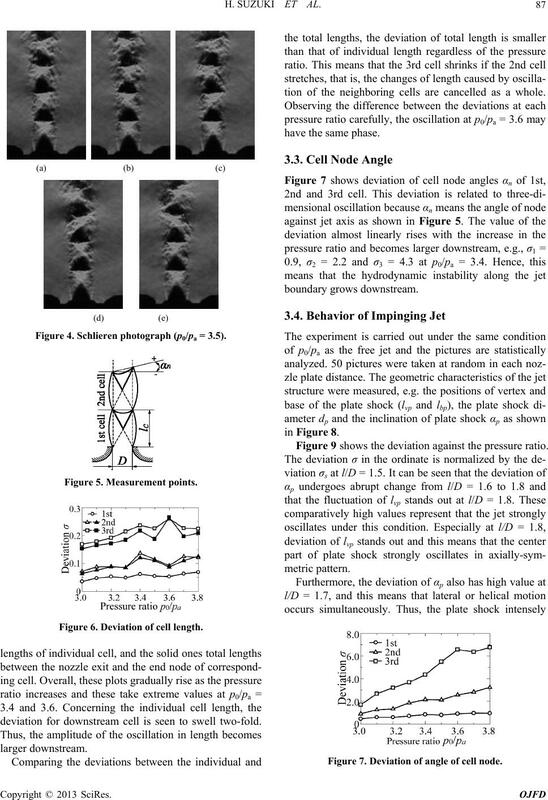 shock cell structure of the underexpanded jet is formed. tion and the wall jet is formed along the plate. laser and a photoelectric sensor. the numerical study was carried out using TVD scheme. Figure 1. Schematic of underexpanded impin ging jet. the jet axis, downstream of the nozzle. period of 18 0 n s .
Figure 3. Vortex measurement system. Euler equations are employed as the governing equations. computational grids are clustered towards the jet axis. Along the jet axis there are 100 grids at uniform intervals. mann variables are kept at constant. be unsteady and oscillate laterally or helically. Figure 5. The cell node between the 1st and 2nd cell, i.e. end node of cell, is defined as 1st cell node, and so on. Figure 4. Schlieren photograph (p0/pa = 3.5). Figure 6. 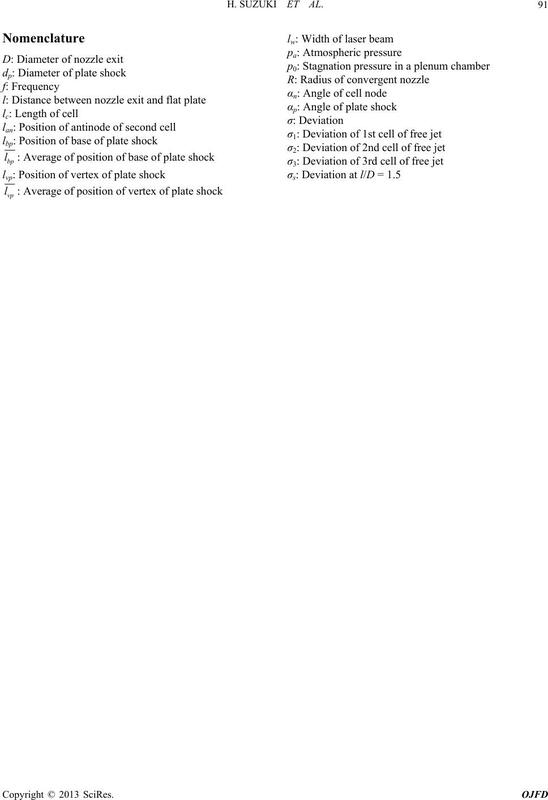 Deviation of cell length. deviation for downstream cell is seen to swell two-fold. hows the deviation against the pressure ratio. tion of the neighboring cells are cancelled as a whole. Figure 7. Deviation of angle of cell node. Figure 9. 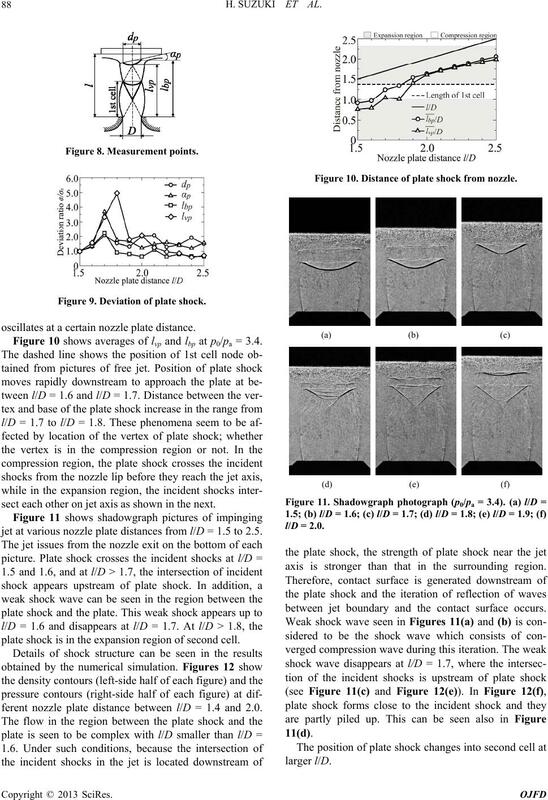 Deviation of plate shock. scillates at a certain nozzle plate distance. sect each other on jet axis as shown in the next. t at various nozzle plate distances from l/D = 1.5 to 2.5.
plate shock is in the expansion region of second cell. ferent nozzle plate distance between l/D = 1.4 and 2.0. Figure 10. 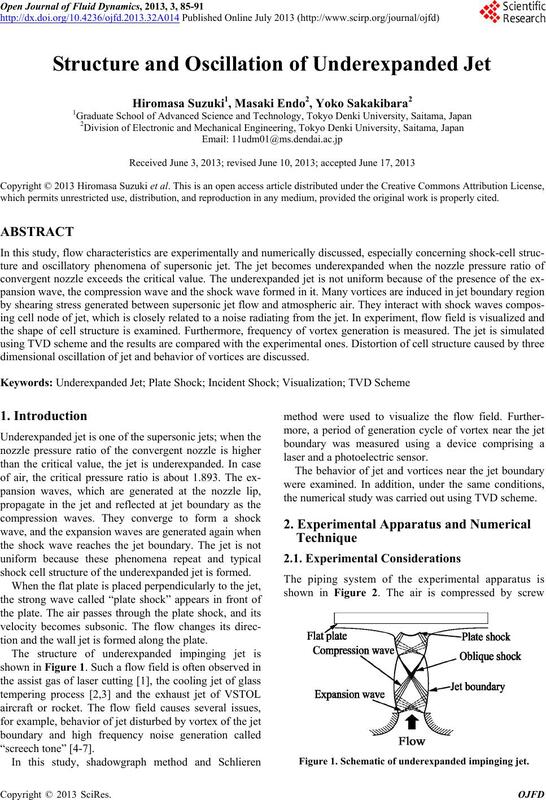 Distance of plate shock from nozzle. axis is stronger than that in the surrounding region. between jet boundary and the contact surface occurs. l/D = 1.9; (h) l/D = 2.0.
the voltage means that a vortex passed through a laser. Figure 13. Output signal wave (p0/pa = 3.0). Figure 14. Frequency of vortex generation and sound wave. 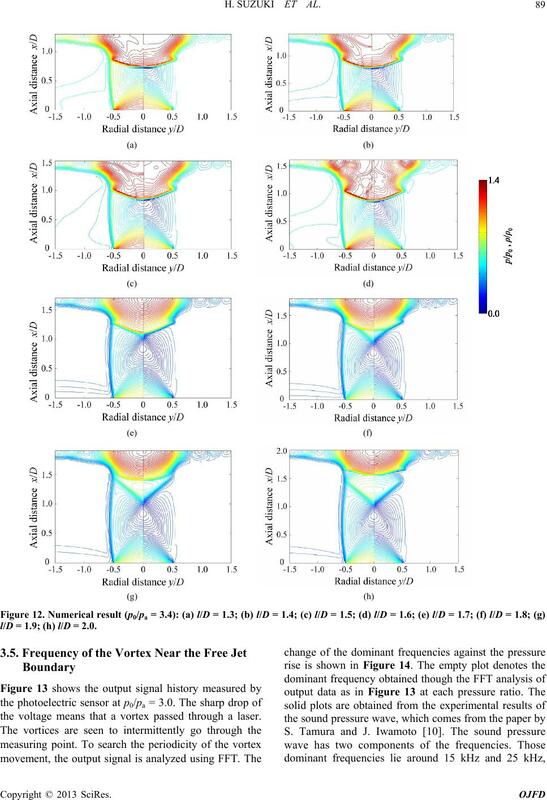 behavior of the vortex moving along the jet boundary. with rise of pressure ratio . ima at some pressure ratios. near the end of expansion region. tex generation and that of sound wave. Power Lasers, Vol. 801, 1987, pp. 243-250. Sendai, 21-26 July 1991, pp. 1277-1282.
the American Ceramics Society, Vol. 51, No. 2, 1968, pp. Journal, Vol. 30, No. 10, 1992, pp. 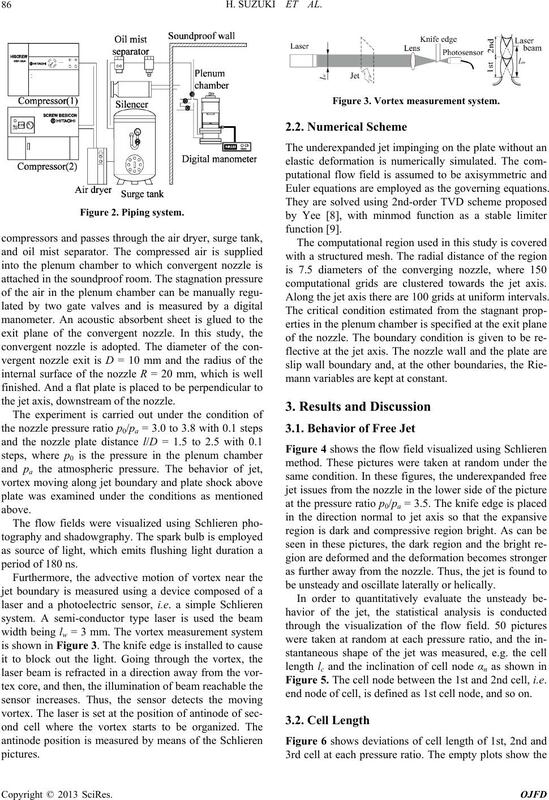 2395-2401.
ing Jets,” Journal of Fluid Mechanics, Vol. 363, 1998, pp. gineers, Series B, Vol. 60, No. 579, 1994, pp. 283-289.